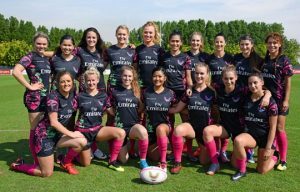 After six months of training, drills, and preparation, the EK Firebirds, an all-women’s rugby club comprised of Emirates Cabin Crew coming from 14 different nationalities, including Australia, is ready to compete at the 2018 edition of the Emirates Airline Dubai Rugby Sevens invitational women’s tournament. The EK Firebirds squad met with the USA Women’s Eagles yesterday, the national sevens rugby team, for a mini-training camp ahead of the tournament, where they ran through practice scrums, along with kicking and tackling techniques and exercises. The EK Firebirds team members come from rugby loving nations including the UK, Australia, New Zealand and South Africa, as well as other diverse nations like Romania, Slovakia, the Czech Republic, Namibia, the Philippines and Nigeria – reflecting the multi-cultural Cabin Crew team at the airline and the global make up of Dubai. The team members have found time to practice and train during their busy travel rosters, and organise themselves to ensure that as many of them train together as possible, using the Sevens stadium, Zaabeel Park and other venues in Dubai as their training grounds. The club started in 2012 with four Emirates Cabin Crew members taking a keen interest in playing rugby. Since then the team has grown to over 15 members, and it continues to actively recruit within the Emirates Cabin Crew community. The EK Firebirds developed from touch rugby to a fully practicing contact rugby 7’s club, and the club has participated in several tournaments. This is the first time that many of the EK Firebirds players will taking to the pitch for a rugby 7’s match at the Emirates Airline Dubai Rugby Sevens. The invitational tournament is held in conjunction with the World Rugby Men’s and Women’s Sevens World Series tournaments. Last year the club became a member of the UAE Rugby Federation and since then they have played at the Women’s Gulf Rugby Tournament. During the tournament, the team’s first squad qualified to the finals at the Women’s Gulf Rugby Cup and the second team made it to the quarter finals. The young women continue to focus on improving their skills, knowledge of the game and conditioning their capabilities even further, and most importantly supporting each other as they pursue their passion for the game of rugby. In fact, Emirates’ diverse 23,000 strong Cabin Crew community includes hundreds of vocational backgrounds and talents spanning music, sports, medicine, law, engineering, teaching, amongst others. The 2018 Emirates Airline Dubai Rugby Sevens kicks off tomorrow at The Sevens Stadium. Now in its 49th year, it is set to be the largest event on record with over 930 rugby and netball matches across three days and enhanced entertainment for everyone. During the Dubai Sevens, Emirates will be bringing the Rugby World Cup and will be displaying it at its hospitality for guests and fans. Along with activating its world-class hospitality and branding across the tournament, Emirates Cabin Crew will be handing out the airline’s signature children’s products and taking keepsake photos of younger fans with Emirates ‘Fly with Me’ mascots.